Surya tv bagged the satellite rights of the latest malayalam movie picket 43. We have already posted that surya tv bagged the rights of Bhaskar The Rascal, fireman, mili, she taxi etc this ear. Surya tv is also bagged some other malayalam films 2015 rights. We will post those rights here, keep stay tuned for satellite rights 2015. Picket 43 is written and directed by major ravi. 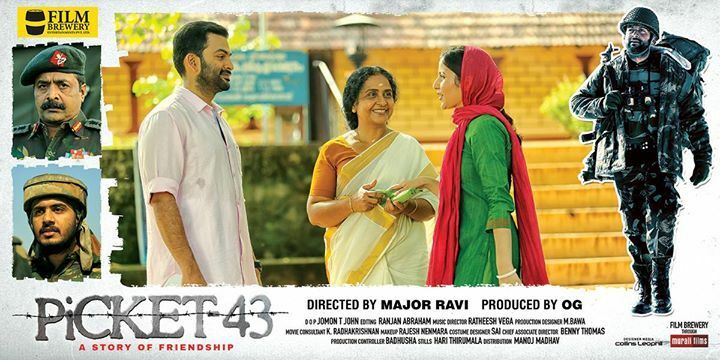 Picket 43 malayalam film is produced by OG Sunil under the banner Film Brewery. Picket 43 is expected to release in Januray 2015. Prithviraj Sukumaran and Javed Jaffrey are playing the major roles in picket 43. Renji Panicker, Sudheer Karamana, Kannan Nair, Haresh Peradi, Angana Roy, Anu Mohan, Anusha, Sreerag Nambiar etc are in supporting cast. Hareendranath Nair is the character played by Prithviraj. He is an Indian soldier guarding an Indian picket in Kashmir. He is meeting a Pakistani soldier Named Mushraff. Javed Jaffrey is doing that role, this is his first film in malayalam. Picket 43 malayalam movie is telling the story of Hareendranath Nair and Mushraff. The friendship between these two are the main plot of picket 43. Jomon T. John is handling the camera of Picket 43. This is the next movie of Major ravi after Karma Yodha. This is his first movie with Prithviraj. Kandahar, Kurukshetra, Mission 90 Days, Keerthi Chakra and Punarji are the other films by major ravi. Most of his film rights are with Surya TV. Stay tuned keralatv.in and satelliterights.com for all the latest updates of all the major malayalam films rights. you can subscribe to us for all the latest posts. We will publish more films rights 2015 Soon here. Prithvi’s last release was Sapthamashree Thaskaraha and Its rights also with surya tv. Double Barrel directed by Lijo Jose Pellissery is another major project of prithviraj in the year 2015. Double Barrel Aka Iratta Kuzhal is expected to release on April 2015.